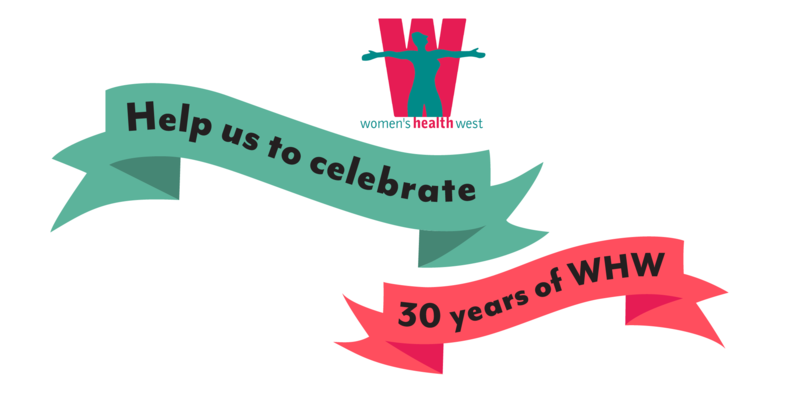 Women’s Health West are delighted to be celebrating a milestone in 2018: it’s our 30th birthday! This year our AGM and annual conversation will be a special one. We’ll be celebrating with an incredible line up of speakers, entertainment and of course, cake. The event will commence with the ‘business’ part of the AGM, where we’ll take the time to reflect on the 2017-18 year for Women’s Health West, and hear about some of the amazing work being doing by our team. There will then be a panel discussion to celebrate and commemorate 30 years of Women’s Health West. The speakers will reflect on the achievements of the women’s health sector over the past 30 years, and discuss how feminism, gender equity and Women’s Health West as an organisation have evolved and changed over this period of time. The speakers will share their insights on where we were, where we are now, and where we want to be in the future – as women, as a women’s health sector, and as feminists who live, work, or play in Melbourne’s west. Short bios of the panel members can be found below, click on their names to read more. Nelly Thomas will MC the AGM, and chair the panel discussion. We’re also delighted that there will be a special performance by spoken word artist Fleassy Malay. Footscray Community Arts Centre, 45 Moreland Street, Footscray, VIC, 3013. Event starts promptly at 4.30pm. Networking and plenty of celebratory food available after the event from 6pm-6.30pm. Attendance is free, but it’s important to RSVP via eventbrite: http://bit.ly/WHW2018AGM. Mary Draper is currently a member of the Implementation Taskforce on Voluntary Assisted Dying and a board director at Austin Health. Mary has worked across a range of roles in government and community health, and as an independent consultant on health and community services. Mary has worked as the director of clinical governance at the Royal Women’s Hospital, and as a senior lecturer in social science and social work at RMIT. Mary was also the director of the women’s policy coordination unit at the Department of Premier and Cabinet in the mid 80s, at the time Women’s Health West was established. Dr Robyn Gregory is the Chief Executive Officer at Women’s Health West. She has a degree in social work and a PhD focused on sexual and reproductive politics. Robyn has a long term interest in women’s health, safety and wellbeing, with 30 years’ experience working in policy, practice, academia and research-related fields. She has worked at WHW since May 2005, initially as Manager of Health Promotion, Research and Development, and as CEO from 2008. Tina Kuek is 24 years old and of South Sudanese origin, having moved to Australia at the age of nine. Tina started university at 16 years old, and now has postgraduate qualifications in both Anthropology and Law (ANU). Tina is currently a senior policy officer for the state government of Victoria (working on the NDIS). Prior to this, Tina worked for UNHCR and the Australian Department of Defence. Tina speaks three languages and is also a volunteer for HerSpace, who work with women and girls affected by sexual exploitation. Emily Lee-Ack is the Chief Executive Officer of the Office for Women, at the Department of Health and Human Services. The Office for Women is the lead agency on issues relating to women in Victoria, working with organisations and the community to design, implement and evaluate programs that improve the lives of women in Victoria. Prior to this role, Emily was CEO of Women’s Health and Wellbeing Barwon South West, and was a national coordinator at EMILY’s List Australia.